Definition: Vroom’s Expectancy Theory was proposed by Victor. H. Vroom, who believed that people are motivated to perform activities to achieve some goal to the extent they expect that certain actions on their part would help them to achieve the goal. Vroom’s Expectancy Theory is based on the assumption that an individual’s behavior results from the choices made by him with respect to the alternative course of action, which is related to the psychological events occurring simultaneously with the behavior. This means an individual selects a certain behavior over the other behaviors with an expectation of getting results, the one desired for. Thus, Vroom’s Expectancy Theory has its roots in the cognitive concept, i.e. how an individual processes the different elements of motivation. This theory is built around the concept of valence, instrumentality, and Expectancy and, therefore, is often called as VIE theory. Valence: It refers to the value that an individual places on a particular outcome or a strength of an individual’s preference for the expected rewards of the outcome. To have a positive valence, one should prefer attaining the outcome to not attaining it. For example, if an employee gets motivated by promotions, then he might not value offers of increased incentives. The valence is zero if an individual prefers not attaining outcomes to attaining it. In the above example, an employee agrees with the increased incentives. Instrumentality: Another major input into the valence is the instrumentality of first level outcome in obtaining the second level outcome, i.e. a degree to which the first level leads to the second level outcome. For example, suppose an employee desires promotion and he feel that superior performance is a key factor to achieve the goal. Thus, his first level outcomes are superior, average and poor performance and the second level outcome is the promotion. Hence, the first level outcome of high performance acquires the positive valence so as to have the expected relationship with the second level outcome of the promotion. Thus, an employee will be motivated to perform efficiently with a desire to get promoted. Expectancy: Expectancy, another factor that determines the motivation, refers to the probability that a particular action will lead to the desired outcome. 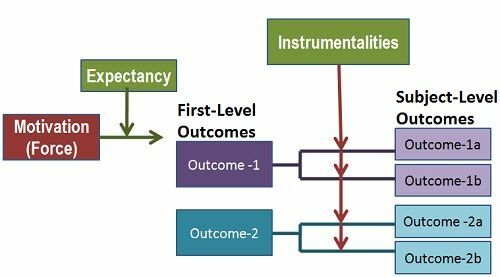 The expectancy is different from the instrumentality in the sense; it relates efforts to the first level outcome, whereas the instrumentality relates to first and second-level outcomes to each other. Thus, expectancy is the probability that a particular action will lead to a particular first-level outcome.